Birefringence is an optical property exhibited by tissues such as muscle, cartilage and tendons. It arises from the arrangement of sub-cellular fibrous structures within the tissue, and reflects the degree of organisation of these structures. When the tissue is damaged, or undergoes necrosis, this structure degenerates with a corresponding reduction in birefringence. The degree of birefringence, thus, gives an indication of the degree of tissue damage . Birefringence in general is an optical property of materials where the speed of light in the material differs as a function of the polarisation state of the light. It arises from an anisotropy in the dielectric permittivity of a medium at optical frequencies, which results in polarisation dependent phase velocity. There are two types of birefringence: linear birefringence, in which the polarisation states correspond to different orthogonal linear polarisations (e.g., horizontal and vertical) and circular birefringence, sometimes called optical rotation or optical activity, in which the polarisation states correspond to different circular polarisations (clockwise and counter-clockwise). In linearly birefringent materials, linearly polarised light with the linear polarisation aligned with the optical axis of the material encounters a different index of refraction to light aligned perpendicular to the optical axis. The birefringence of the material, ∆n is given by the difference in these refractive indices . In the case of linear birefringence, the optical axis is ideally fixed in the transverse plane, but in circular birefringence it varies with axial distance. The round-trip nature of light propagation through a sample in OCT makes it difficult to measure circular birefringence ; the studies performed by our group have been more concerned with linear birefringence. where λ is the wavelength of the incident light, ∆n is the birefringence of the material and z is the distance travelled through the material . Polarisation-sensitive optical coherence tomography (PS-OCT) is a set of hardware and software extensions to OCT which allows us to measure the depth-resolved phase retardation caused by a tissue sample , and hence, calculate the birefringence of local regions of the tissue. Schematic of a simple fibre-based PS-OCT system used in our group (PSOCT-1300, Thorlabs, New Jersey). SSL swept-source laser; PC polarisation controller; Pol polariser; Circ circulator; FC fibre-coupler; Col collimator; VA variable attenuator; M mirror; PBS polarising beam splitter. 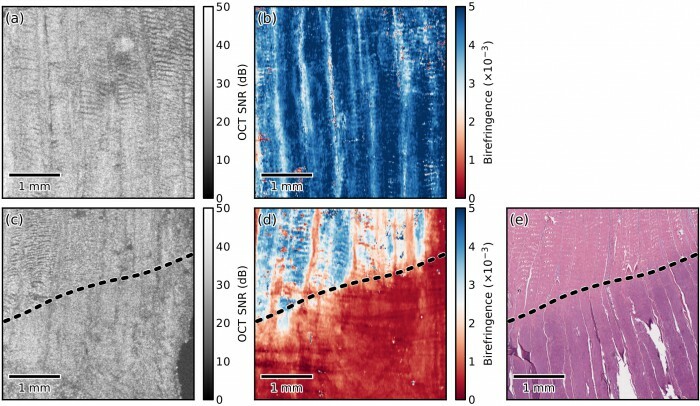 Illustration of the relationship between tissue structure and the birefringence detected using PS-OCT. Healthy, intact fibrous tissue gives rise to a rapid rate of change of phase retardation with depth, producing a high birefringence. Conversely, if the tissue structure is damaged, this gives rise to a slower rate of change of phase retardation, which produces a lower birefringence. From Equation (1), we can calculate the birefringence at every point on the tissue surface. We refer to this map as a parametric image , where the pixel intensity at each (x, y) location is indicative of an optical parameter, birefringence, calculated from the underlying PS-OCT data. This image gives a visual representation of the changes in birefringence, and hence the spatial extent of tissue damage. The parametric birefringence method summarised here is fully described in Chin et al., 2013 . Firstly, each voxel in the PS-OCT data volume is converted into a four-element Stokes vector, S = [I, Q, U, V]T, which fully represents the polarisation state of light backscattered from that location in the tissue. A standard OCT image can be formed from the data in the I component, and because PS-OCT detects only the fully polarised component of backscattered light, the reduced Stokes vector (hereafter, Stokes vector), S = [Q, U, V]T, is sufficient to describe the polarisation state . where • is the 3D vector dot product and ||·|| denotes the Euclidian norm. Equation (2) produces an estimate for the phase retardation which is wrapped between –π and π radians, and in general, must be unwrapped. We use a method based around first demodulating cos[η(z)] using the Hilbert transformation, then unwrapping the resulting demodulated phase . The slope of the unwrapped phase retardation is then calculated using weighted least squares linear regression, with the weights being the OCT SNR of each voxel, and the birefringence calculated using Equation (1) . The en face birefringence map is generated by applying this produce across every (x, y) location of the tissue surface. Example of en face parametric birefringence imaging using PS-OCT applied to a section of heat-damaged porcine tendon (Reproduced from ). (a) En face OCT and (b) parametric birefringence images of the sample before heating. (c) En face OCT and (d) parametric birefringence images of the sample after the lower half of the sample was immersed into heated (69 °C) physiological Krebs solution for 5 minutes. (e) Haematoxylin and eosin (H&E) stained histological section corresponding to the region shown in (c) and (d). The dashed lines indicate the location of the liquid-air boundary during heating. The results of the heat damage are clearly visible in the histology (purple region), and the parametric birefringence image (red region). D. J. Maitland, and J. J. T. Walsh, “Quantitative measurements of linear birefringence during heating of native collagen,” Lasers Surg. Med. 20(3), 310-318 (1997). B. H. Park, and J. F. de Boer, “Polarization-Sensitive Optical Coherence Tomography,” in Optical Coherence Tomography: Technology and Applications, W. Drexler, and J. G. Fujimoto, eds. (Springer, 2008), pp. 653-695. S. G. Adie, T. R. Hillman, and D. D. Sampson, “Detection of multiple scattering in optical coherence tomography using the spatial distribution of Stokes vectors,” Opt. Express 15(26), 18033-18049 (2007).